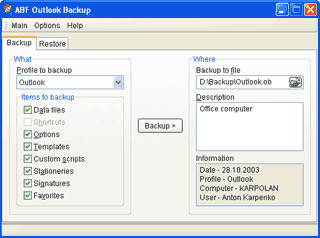 ABF Outlook Backup is a backup and synchronization tool for the MS Outlook. It allows you to backup and restore messages, address book, settings, accounts, message rules, junk email lists, signatures, and even Internet favorites. All parts can be processed either separately or together. The program allows to backup data on the one computer and restoring on the other, this feature makes it a real synchronization tool.